Nabil Khattab: How and when Do Educational Aspirations, Expectations and Achievement Align? This paper proposes a new typology of educational aspirations, expectations and achievement. This typology is derived from combinations of aspirations, expectations and achievement, creating eight possible combinations of aligned and irregular profiles. To devise this new typology, data from the Longitudinal Study of Young People in England (LSYPE) panel survey and matching administrative data from the National Pupil Database (NPD) was utilised. These data were collected in 2004 from a sample of 15,770 young people (YP) aged 13 to 14 attending 647 different schools in England. This study demonstrates that aspirations, expectations and achievement do converge amongst some students; but for most young people they do not always intersect. Many young people succeed academically, but without necessarily developing high aspirations or high expectations. For one out of every five young people, high aspirations and high expectations do not lead to academic achievement. The findings in this paper provide a distinct analytical framework for further research and policy development in this area. 1.1 Norms and values associated with different classes and ethnic groups are often the main driving forces that stimulate attitudes underscoring the importance of education in the lives of young people and for their future. These, in turn, affect the behaviour of young people at school and, subsequently, their educational performance levels. Sociologists in the 1960s and 1970s (Sugarman 1970, Willis 1977,Marini and Greenberger 1978) have highlighted class and gender differences in relation to the valuing of formal educational achievement as a means of upward social mobility. For example, these studies have pointed out that middle-class students (and boys more than girls) place a higher value on educational achievement than working and lower class students. Thus, the latter are likely to have lower levels of aspirations and school performance. These students' aspirations and expectations were regarded as an accurate predictor of their future educational performance. However, recent generations of students have tended to develop ambitious future plans (aspirations) regardless of their actual educational achievement. For example, Schneider and Stevenson (1999) defined contemporary American young people as 'the ambitious generation', arguing that rising ambitions occur among students from all sexes or ethnic, racial and class backgrounds. Conversely, they also found that many of these students have 'misaligned ambitions,' or are caught in what they define as the 'ambitions paradox'. According to this theory, students who are caught in this paradox tend to have high ambitions but lack the knowledge and skills they need to achieve their aims. Moreover, there are two aspects of the 'ambitions paradox': 1. a gap between educational plans and educational achievement, and 2. a gap between educational and occupational goals (e.g. a divergence between expected and required levels of education for the employment they aspire to obtain in the future). Furthermore, Hanson (1994), who used a three-dimensional approach; found a paradox not only between aspirations and achievement, but also between aspirations and expectations, and between expectations and achievement. 1.2 This paradox has been well reported in the literature, even before the publication of Schneider and Stevenson's work (Sue and Okazaki 1990, Mickelson 1990). Yet little if any attention has been paid to exploring and understanding situations of the 'ambitions paradox' where actual achievement is higher than aspirations, expectations, or both. This leaves us with a limited understanding of the relationship between these different concepts and growing concerns about the importance of aspirations and expectations as predictors of educational achievement. 1.3 It is certainly important to understand why some students may hold aspirations or even expectations that are beyond their ability to achieve in reality. Equally important, if not more, is the ability to understand why some students may actually end up achieving more than what they would aspire to or even expect. The latter option has been largely neglected by the 'misaligned ambitions' theory and by most studies in this field. In this paper, the theory of aligned ambitions is utilised in conjunction with Hanson's three-dimensional approach to explore the entire range of the ways in which educational aspirations, expectations and achievement interact (match and mismatch), and to then develop a new typology of these interactions. Additionally, I draw upon 'ethnic capital theory' proposed by Modood (2004) and Zhou (2005) in order to account for any ethnic and religious differences in the formation of aspirations and expectations, and their association with educational success. Doing, this contributes greater ethnic, cultural and religious sensitivity to the proposed new typology. 1.4 The aim of this paper is thus to devise a new typology of educational aspirations, expectations and achievement, thereby offering a more useful way of conceptualising various situations of aligned and misaligned aspirations, expectations and actual achievement. I will refer to these situations hereafter as profiles (types of ambitions). Following its formation, the typology will be used as the main dependent variable in the empirical analysis. Unlike the vast majority of studies in this field, this one does not use aspirations or expectations as predictors of scholastic achievement or vice-versa. Rather, the dependent variable is the combination of the three of them together, suggesting that these three constructs only converge under certain conditions. Moreover, I argue that the destination profile (location within this typology) is not only determined by the different social and economic opportunity structures available to students depending on gender, ethnicity and class, but also by a different set of values and norms (subculture) held by the young people and their parents (Sugarman 1970). For example, limited social and economic resources might lead some students to lower their aspirations when associated with a subculture that places a lower value on education. The very same social and economic resources might have a different impact in relation to aspirations, expectations and achievement (or no impact at all) if associated with a subculture that perceives education as the primary means of social mobility. This line of argument draws, amongst other things, on a recent study by Mountford-Zimdars et al. (2013). They found some significant gender and class differences in the responses to attitudes towards the expansion of higher education opportunities and the value of university education. Working-class respondents and female respondents favour an expansion of university opportunities more than graduates and male respondents (p. 809). 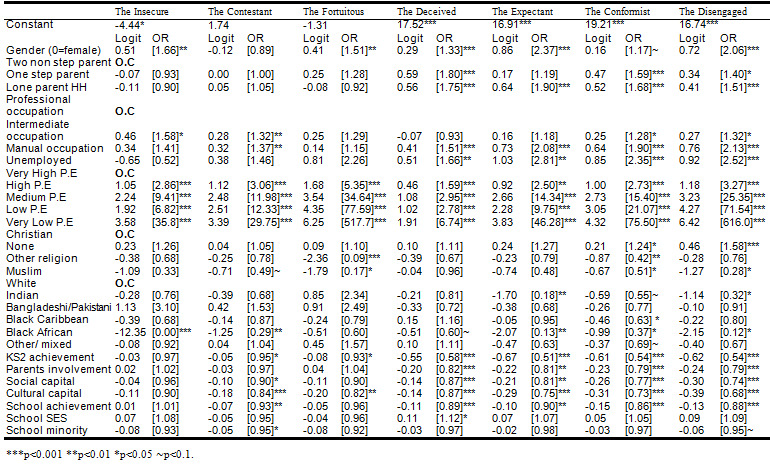 1.5 In the next section, I present some theoretical considerations followed by the data methods. The third section presents the proposed new typology. The findings are presented in the fourth section, followed by a discussion and conclusions. When you're 16 and have finished Year 11 at school what do you want to do next? 2.2 This question, which asks respondents to indicate their plans and hopes, has been used by many scholars as a measure of future aspirations. For example, Strand and Winston (2008) (see also Strand 2011) used the same question to measure educational aspirations (p. 256). Rose and Baird (2013) used the same question to measure future educational and employment aspirations (p. 163), and Gutman and Schoon (2012) used a similar question to measure uncertainty over career aspirations (p. 612). How likely do you think it is that you will ever apply to go to university to do a degree? How likely do you think it is that if you do apply to go to university you will get in? 2.4 Bohon et al. (2006) have pointed out that aspirations and expectations are empirically and cognitively different. Thus, aspirations and expectations are not different sides of the same coin, and are not conceptually similar. Aspirations could be said to be rooted in the cultural sphere of society (within common shared values), whereas expectations are determined by the perceived structure of opportunity within society. In some cases and under certain conditions they might converge with the actual attainment, but in many other cases they are likely to diverge and have a different relationship to future achievement. In this paper I argue that social capital and cultural capital are two important factors that determine when and how aspirations, expectations and achievement correlate with each other. In what follows I discuss each of them respectively. 2.5 Family and community social capital can emerge as an important resource in raising educational aspirations, thereby upholding student beliefs in their ability to realise their aspirations and, eventually, reach their goals (Schneider and Stevenson 1999). The parent-child relationship provides both a positive and a smooth transmission of the family cultural values and norms to children. It shapes the child's aspirations, career choices and the propensity to pursue additional education (Gibbons 2002, Watts and Bridges 2006, Gutman and Akerman 2008).The community dynamics or social capital, as defined more recently by Robert Putnam (1995), is central to this theory. Beginning with the assertion that social networks influence expectations and aspirations (Green and White 2007), 'bonding capital', especially in deprived neighbourhoods, can reinforce existing levels of aspirations and expectations. In more economically affluent families, family social capital plays an important role in enabling students to benefit from family human, economic and cultural capital (Marjoribanks 2002), but also provides access to other resources via bridging capital (Kim and Schneider 2005),which further aligns the combination of aspirations, expectations and achievement. 2.6 However, it has been asserted that different ethnic groups socialise different levels of motivation to reach for educational achievement into their children (Modood 2004), along with different attitudes toward schooling (Caplan et al. 1991) and the importance of education and hard work as means of social mobility (Zhou 2005,Zhou and Bankston 1998). Within these groups, children are able to compensate for their socio-economic deficit through strong parental involvement, aspirations and hard work (Modood 2004, Shah et al. 2010,Strand 2011). For instance, Modood 2004 (see also Zhou 2005 and Shah et al. 2010),who draws on Coleman's notion of social capital, argues (through his definition of ethnic capital) that 'economic disadvantage can be compensated by social capital in the form of family norms, values and networks, as well as a broader set of community values and networks which promote particular educational goals.' Additionally, Shah et al. state that 'ethnic social relations and ethnic institutions can be conduits of cultural and social capital and therefore become constitutive of class positioning' (Shah et al. 2010: 1111).Thus, parental aspirations and expectations that can be channelled to children via strong social relationships would play a key role in determining the ways in which aspirations, expectations and achievement are associated. 2.7 While social capital is often formed within communities and groups rather than within families, cultural capital is a home-based resource, although large parts of it are gained and acquired through participation in activities outside the home such as visits to galleries, theatres and museums. Dominant classes need strong intra-family ties and inter-family networks for the successful transmission of their cultural capital and habitus onto their children. In this regard, social capital is an important mechanism for retaining class-based forms of knowledge and linguistic ability, which are manifested in extended vocabulary, the ability to handle abstract and logical reasoning, and familiarity with high culture (Bourdieu 1997). The dominant classes possess sufficient cultural capital, which significantly influences the way in which their children are socialised (including cultural participation, active transfer, attitudes and beliefs), as well as promoting a certain work ethic and orientation toward education and employment (Bourdieu 1984). Sullivan (2007) further distinguished a number of ways in which cultural capital shapes child-rearing, and, consequently, educational success. 2.8 First, parents who expose their children to culture, such as theatre or art, introduce them to abstract ideas. Second, parents transfer their value towards education when they actively read to their children or help them with their school work using their own knowledge. Third, there are the passive transfers made by parents, whereby students acquire certain ways of talking and thinking as parents discuss with them or are heard discussing various topics. Fourth, attitudes and beliefs are important for parents to instil into their children a certain work ethic and orientation toward education and employment — an 'ethos' that coincides with what is fostered in schools. Finally, 'social styles,' or modes of parental engagement with the school, actively engage and support the education of their children beyond time spent in school. 2.9 The consequences of these differential socialisations are that students from dominant classes possess an abundance of what the school claims to create, because they also gain extra intellectual nurturance outside of its walls. These students are likely to be high achievers and, needless to say, have high aspirations and expectations as part of their cultural capital. Parents of lesser means lack cultural capital and therefore cannot pass these advantages onto their children. Their children are likely to develop a profile in which their aspirations, expectations and their actual academic outcomes are aligned, but at the lower end. 2.10 The 'Wisconsin model of status achievement' by Sewell and Hauser (1975) is probably the most famous research in this field. According to this model, educational expectations of students are seen as an important mediating factor between socio-economic status and the future attainment and status of children (Jencks et al. 1983, Sewell and Hauser 1975,Alexander and Eckland 1975). Some even perceive educational expectations as the most influential vessel for intergenerational transmission of social status, even more so than measurements of scholarly or cognitive ability (Jencks et al. 1983). The question of whether aspirations and expectations influence school performance and future educational and occupational attainment has remained central to many studies since the publication of the Wisconsin Model and throughout the period. However, since the 1990s in the US, and more recently in the UK, many studies have started questioning the role of aspirations and expectations as a vehicle for raising students' school achievement. For example, Mickelson (1990), Sue and Okazaki (1990), Hanson (1994) and Schneider and Stevenson (1999) found that many students have educational aspirations that are unrelated to either their actual performance at school or their future occupational goals and objectives. Similarly, Kao and Tienda (1998) pointed out that the educational aspirations of Afro-American students do not result in equivalent good school achievement. In a more recent study looking at this question amongst Latino students in the US a similar conclusion was reached (Hill and Torres 2010). 2.11 Likewise, in the UK, the role of aspirations as an important factor to raise the achievement of students, especially those from disadvantaged backgrounds, has been critically questioned by a number of recent studies, including a series of reports for the Joseph Rowntree Foundation (Carter-Wall and Whitfield 2012, Cummings et al. 2012,Gorard et al. 2012). The general conclusion of these studies is that there is no evidence that changing (raising) aspirations can improve the academic achievement of these students, which is contrary to what politicians and other policy makers have assumed (St. Clair et al. 2013). 2.12 The fact that these studies have found no solid evidence to link aspirations to educational achievement does not mean that no such link exists. These studies have looked for a causal link between higher levels of aspirations and better school performance or higher achievement. The relationship between these aspirations and educational achievement might be contextual. Namely, it operates within certain socio-economic contexts but not within others. Moreover, it may also be the case that aspirations do not operate as an engine or a generator of educational attainment, but as a 'steering wheel' that directs school performance towards future educational goals. The typology I propose here could help solve this puzzle. In the next section of the paper I present and discuss the data and methods, including the construction of the new typology. 3.1 To build the proposed new typology, I used data obtained from waves 1-3 of the Longitudinal Study of Young People in England (LSYPE) panel survey and from the National Pupil Database (NPD). 3.2 Most of the measurements of this study were derived from the wave 1 sample (N=15,770) when pupils were in Year 9 (age 13-14). The information on achievement (GCSE results) was obtained from the NPD data. Gender - Gender was coded as (0) for females and (1) for males. Religion - Religion is based on self-definition of the individuals, who could choose between eight categories in the original survey. These were later reduced to four main categories due to the small group size of some of the categories and complexity of the model. Those remaining are the three major religious categories in Britain - Christian (reference group), no religion, or Muslim, - and aggregated smaller religions - Sikh, Jewish, Buddhist, Hindu and another heterogeneous group. As in the case of gender, non-response at wave 1 is retrieved with data from waves 2 and 3. Ethnic origin - Ethnic origin is measured by self-definition of the YP using 16 categories of choice recoded into six categories: Whites (reference group), Bangladeshis and Pakistanis, Black Africans, Black Caribbeans, Indians, and all groups of 'mixed' or 'other' origin. Marital status of parents - Family history of household in the LSYPE enables the characterisation of students according to the specific marital statuses of parents: students living with two biological parents, those living with two parents but where one is not biological, and those living with only one parent. Social capital of family - Social capital of family is derived using three related pairs of ordinal variables (one for each parent) that summarise the quality and quantity of intra-family relations. The first pair refers to quantity of disputes between a student and their parents. The second pair measures frequency of quality talks between students and parents. The third pair is the students' response to the question 'how well do you get along with your parents?'. Every pair is combined by including the higher of two items, i.e. the more positive answer referring either to the main parent or a step parent. This resulted in three ordinal 'family level' variables. It would not have been empirically (or theoretically) sound to average or simply combine these variables together because the first dimension explained 53.7% of the total variance of the variables. Thus, a CATPCA solution is used, resulting in one continuous measure of social capital. All items are unidirectional, with loadings of between 0.62 for the variable scaling 'talking with parents' to 0.83 for the item 'how well the young person gets on with parents' (Cronbach α =0.570). Cultural capital - A cultural capital measure is derived from activities such as learning a musical instrument, participating in community work, or reading for pleasure. They are presumed to fit and describe the cultural background valued by the school system. Additionally, satisfaction with school facilities was taken into account, for this measurement can help convey the fit between the habitus of students and the cultural capital present in the field of education. These measurements were combined using CATPCA. Object scores on the first dimension explain 28.7% of the variation in items. All loadings ranged 0.624 to 0.685, with the exception of 'activities' which had a low loading of 0.23. Parental involvement in school life- The parental involvement scale is based on six ordinal items measuring different facets of the connection of parents to their children's school life, such as the frequency of parents talking with the young people about their school reports, the frequency of parents' participation in school activities, the frequency of parental engagement in meetings and conversations with teachers, and a general item on a parent's feelings toward their child's involvement in school. These items were combined, using CATPCA, into one continuous dimension representing all items while losing minimal information. One dimension was found to explain 31.2% of the total variance (Cronbach α=0.431). All loadings ranged between 0.571 and 0.761, with the exception of reading school reports, which had a low loading of 0.158. Parental expectations - Parental expectations are measured as an ordinal variable. It consists of a parent's estimation of the probability that the student will attain higher education, using a four-point ordinal scale ranging from 'very likely' to 'not at all likely'. To this is added a fifth category including main parents who did not think their child would continue in full-time education beyond school leaving age (age 16). Parental occupational class - Occupational class is measured using National Statistics Socio-Economic Classification (NS-SEC) collapsed into three hierarchical categories and a fourth 'long term unemployed' category (cf. SOC 2010). This classification is comparable with and transferable into the well-known classification scheme of social class based on occupation (EGP) (Goldthorpe 2007). Student's previous achievement - Previous achievement is measured using the student's KS2 fine-graded point score average in English, Math and Science. This was more appropriate than the traditional measurement which defines five levels of a pupil's achievement, because it enabled us to determine intermediate values between the different levels. Achievement level of school - Achievement level of school was measured using average KS3 point score per eligible pupil in school year 2004, derived from NPD administrative data. Ethnic composition of school - Ethnic composition was measured as the proportion of pupils who defined themselves as part of a minority group of all pupils attending the school, derived from NPD administrative data. SES of school -SES of school was measured by using the percentage of pupils eligible for free school meals, derived from NPD administrative data. 4.1 The dependent variable (the new typology), which is summarised in Table 1, was constructed using three binary variables.The first binary variable, student educational aspirations, measured at time 0, distinguishes between those who aspire to continue onto full-time education after the age of 16 and those with no such aspirations. 4.2 The second binary variable, student educational expectations, also measured at time 0, was recoded into two categories: 1) students who stated that they were likely to apply to and get into university, and 2) those who stated they were not likely to do so. The variable was derived from two different questions: in the first, students were asked to assess the likelihood of applying to university, and, in the second, they were asked to assess the likelihood of getting in, given they had applied to university. 4.3 Where a student answered that they were fairly or very likely to apply to university and get in, they have been coded as 1, indicating high educational expectations. All other answers have been coded as 0. The question on aspirations only asked about future intentions and plans, whereas the questions on expectations asked students to assess the chance or probability of the occurrence of each event. 4.4 The third variable is educational achievement measured at time 1, when students were aged 16. This variable has two categories: 1) pupils achieving between A*-C in five or more GSCE subjects, and 2) those who did not achieve between A*-C in five or more GSCE subjects. Before cross-tabulating these three variables, I have examined the correlation between them using Spearman's rho, which is presented in Table 1 below. 4.5 The results show that all three are significantly correlated with each other. However, educational achievement has a stronger relationship with educational expectations (α=0.35) than with educational aspirations (α=0.278). Aspirations and expectations have an even stronger relationship (α=0.39). All of these associations are relatively strong and statistically significant, but not to the extent of causing a multicollinearity problem. They are associated to each other, but seem to measure different features and aspects of students' educational profiles, allowing me to proceed with constructing the new typology. 4.7 I. The first profile (the 'Confident') represents complete consistency at the highest levels, where educational aspirations, expectations and achievement are all positive. Over a third (37%) of all students in the data fall within this profile; this makes it the most common one. According to the Bourdieuian theory of cultural capital and habitus, and Goldthorpe's theory (2007), this category is likely to include middle-class students from families with abundant social, cultural and human capital. In these families, high aspirations are the norm. The availability of resources (including all forms of capital) and parents who facilitate these resources help to convert one form of capital into other forms. This leads to high expectations on the part of the students, particularly the perception that they are able to achieve at least what their parents achieved. One of the main features of this group is the belief or confidence that they are in control of their destiny. 4.8 II. The second profile (the 'Deceived') characterises just over a fifth (22%) of all students in the data. It consists of students who have high aspirations and genuinely believe they will fulfil their aspirations, but who in reality end up with low achievement. This might be due to a lack of financial or educational resources, or unfamiliarity with the ways in which systems work or standards are attained. Attending low-quality schools, where real competition is absent, would also produce high aspirations and expectations combined with low achievement (the 'frog-pond effect'). This is evident in the case of Palestinian students in Israel. It was found that these students have high aspirations and high expectations, but attain lower achievement levels (Khattab 2003). Their aspirations and expectations are highly correlated with each other, but disconnected from reality (their actual achievement). This profile is likely to be associated with minorities (ethnic or national) who perceive education as a channel for social mobility but are also led to believe that the educational system is a 'fair game'. Additionally, this type may feature groups who are residentially and educationally segregated from the dominant group, which hides them from the 'real world', leading to the development of unrealistic hopes and dreams. These groups do not have access to the avenues through which middle-class groups attain success, i.e. well-connected parents, knowledge of tutors, or role models. Additionally, the price (cost) of education is too high for these students and their families (Breen and Goldthorpe 1997). 4.9 III. Around 8% of students in the data fall within the third profile the 'Contestant'. This profile includes students who have developed high aspirations, have low expectations, but obtain high achievement. These students are likely to have been raised in families where education is highly valued and appreciated, but, at the same time, to face a harsh reality, either in terms of material resources or in experiencing a competitive environment (for example at school). In both cases students are more conservative in relation to assessing their chances of fulfilling their aspirations. Their high achievement may result from hard work facilitated by the mobilisation of resources on the part of families with limited means, such as utilising means available to middle-class groups, e.g. Tutors (Abbas 2007). 4.10 IV. The fourth profile describes 17% of students in the data. These students reflect the societal norms (and values) attached to education; however, their poor socio-economic backgrounds and perhaps lack of family support and resource mobilisation unfortunately causes low expectations that lead to low achievement. These students are labelled as the 'Conformists' since they accept the norms that education is important (hence their high aspirations), but are aware of their disadvantageous material and economic circumstances, resulting in low expectations and low achievement. 4.11 V. Only 1% of all students fall within the 'Insecure' profile. This profile refers to students whose aspirations are far removed from their expectations or achievement. While it is not surprising to find students with high aspirations but low expectations, as in the case of the 'Conformist', it requires more effort to understand how an individual can hold low educational aspirations but still have high expectations and high achievement. One possible explanation is that they are unsure of their future plans or do not want to commit themselves to such plans; yet, they are confident of their ability to go to university (if they want to), for example, and this confidence contributes to their expectations of high achievement. Low aspirations among these students might be a result of weak family social capital and their ties. It may also be a factor of high ability and low confidence. 4.12 VI. The sixth profile consists of 2% of students in the data that have succeeded in obtaining high achievement in spite of their low aspirations and low expectations. Their achievement is explained neither by their aspirations nor by their expectations. They can be labelled as the 'Fortuitous', for they have arrived at a destination unintentionally. It seems that these students' success has been achieved against all odds. One explanation offered at this stage is that these students might have been targeted by special programmes, institutions or community initiatives designed for underachievers from underprivileged families. 4.13 VII. Another 2% of students fall within the 'Expectant' profile. This profile includes students who have low aspirations, high expectations and low achievement. In other words, their expectations are out of line with their low aspirations and achievement. These students might have received incorrect signals regarding their actual ability from their environment (school, parents, or both). Additionally, they might have attended low-quality schools where academic ability is lower on average, and competition is rare, which could have given them a false perception of their abilities. The latter explanation accounts for their low aspirations, too, as they would be the norm in such an environment (Shavit and Williams 1985). 4.14 VIII. The remaining 11% of all students in the data fall within the 'Disengaged' profile. This last profile includes students with low aspirations, low expectations and low achievement. These students tend to be disengaged from schooling or education, often consciously and by being involved in activities other than academic or educational activities (Archer et al. 2007). To some extent, this profile constitutes the antithesis of the first profile ('The Confident'), where all the three dimensions (aspirations, expectations and achievement) are in the opposite direction. Young people falling within the 'Disengaged' profile are likely to be of working-class (Archer et al. 2007, Willis 1977) and/or minority background, or immigrants (Kao and Tienda 1998, Portes et al. 2010). Sometimes, these children hold anti-schooling attitudes as 'counterculture' that devalues the norms of their middle-class counterparts (Willis 1977). 4.15 To predict the probability of a student falling into a specific profile, a multinomial logistic regression model was used with a correction for the survey design and weights (controlling for the dependence between students within the same school). The dependent variable used was the typology described earlier on, with all eight profiles included. All of the explanatory factors have been included as main effects. We are aware of the importance of introducing interaction terms in the analysis; however, the cost of these interactions, in terms of complexity and the risk of empty cells, has not been justified by the results (the vast majority of the interactions were insignificant). It was thus decided not to introduce them here. The statistical description of all of the variables included in the analysis is presented in Appendix 1. 5.1 In this section the results of the multinomial analysis are assessed, as well as the range of and extent to which different social, economic and school factors determine the likelihood of falling into any of the profiles compared to the 'Confident' category. The 'Confident' profile is used as the base (reference) category since it is the ideal and most desirable situation (at least from a normative perspective, and for the majority of students). It reflects the state of a complete match (alignment) between high educational aspirations, expectations and achievement. Therefore, any other profile is worse off, or less desirable. Each profile is a product of different social, economic and cultural conditions, and these are not always well pre-planned destinations on the part of students. As already seen (Table 2), students are not equally or randomly distributed across the profiles, suggesting that different students are affected differently by different factors, or by different levels of the same factors in the process of allocation into each of the eight profiles. The first of these factors examined here is gender. 5.2 It seems that relative to the 'Confident', boys are as likely as girls to be in the 'Contestant' and in the 'Conformist' profiles, but they are more likely to be in any one of the remaining profiles, particularly in the 'Expectant', 'Disengaged' and 'Insecure' categories. This suggests that gender has a differential impact on the profile to which a student belongs. 5.3 Family type also has a differential impact upon location within the typology. Compared to families where two biological parents live together, families with one step-parent or a single parent are significantly more likely to fall within the profiles of 'Deceived', 'Conformist' or 'Disengaged'. Young people living with a single parent are also significantly more likely to be in the 'Expectant' profile relative to the 'Confident' profile. In all of these profiles, the achievement component is low, suggesting that family type correlates with low or high achievement profiles regardless of aspirations or expectations. It is worth noting, however, that both coefficients of family type are negative in the 'Insecure' profile. One of the two coefficients of the 'Fortuitous' is negative, too. These coefficients being statistically insignificant should not mask the fact that the influence of family type operates differently in placing students within a typology. Table 3. Multinomial regression (logits and odds-ratios) to predict the probability of falling within each profile of the typology. 5.4 The influence of class background reveals a number of interesting findings. Students whose parental occupational class is lower than the 'professional class' are generally more likely to be in the typology of 'Conformist' or 'Disengaged' rather than 'Confident'. The only exceptions here are the 'unemployed' in the case of the 'Insecure' and the class of 'intermediate occupations' in the case of the 'Deceived'. In both cases, the coefficient is negative but statistically insignificant. 5.5 Parental expectations appear to be the most influential factor in determining the location within the typology. The lower the parental expectations the greater the odds are of falling within a profile other than 'Confident'. The influence of parental expectations highlights and reflects the role of parental or family perceptions and attitudes in forming aligned ambitions. High expectations are likely to stem from a culture or subculture that perceives education as the most important means for social mobility (Khattab 2003). Likewise, low or very low expectations amongst parents might result from a culture that does not emphasise education as an important means for social mobility. This is a central finding in this study and will be discussed further in the next section. 5.6 Profiles most affected by religion are the 'Conformist' and the 'Disengaged'. All other profiles are indifferent from 'Confident' in the ways in which they respond to religion. Equally important is the direction of the influence through which different religious groups operate and their place within the typology. Compared to Christians, students with no religion are more likely to be in profiles other than 'Confident'. These results are statistically significant in the case of 'Conformist' and 'Disengaged'. Unlike groups with no religion, students of other religions and Muslims are less likely to be in any of the profiles compared with Christians relative to 'Confident'. For both these religious groups, the results are particularly significant in the case of the 'Fortuitous' and 'Conformist' profiles; the coefficient of 'Disengaged' is also significant for them. 5.7 The impact of ethnicity is largely weak, except for Black Africans, who, compared to Whites, are significantly less likely to be in most of the profiles relative to 'Confident'. It is important to highlight the fact that some groups have quite large and positive coefficients in relation to some profiles regardless of whether these coefficients are statistically significant or not. The case of Pakistani and Bangladeshi students is the most obvious and interesting: they are three times more likely to be 'Insecure', one and a half times more likely to be 'Contestants' and about two and a half times more likely to be 'Fortuitous' than Whites, relative to 'Confident'. In all of these profiles, achievement is high, whereas aspirations, expectations or both are low. This suggests a noteworthy model of academic achievement (success) in which aspirations, expectations or both are misaligned with achievement. These are the only ethnic groups to have followed such a model. 5.8 Previous academic ability appears to operate in the expected direction, and, in most cases, is significant, except for the 'Insecure' profile. Students with high past academic achievement are likely to be in the 'Confident' profile. 5.9 Parental involvement in student school life is negatively and significantly associated with the profiles of 'Deceived', 'Expectant', 'Conformist' and 'Disengaged', compared with 'Confident.' Likewise, social capital and cultural capital are negatively and significantly associated with most (though not all) of the profiles. Social capital is also negatively associated with 'Contestant'. The only profile that is not associated with cultural capital is the 'Insecure'. 5.10 Turning to school factors, Table 3 above shows that the only important factor is school achievement score, and it operates in the expected direction. In other words, students attending schools with high achievement are less likely to be in most profiles, relative to the 'Confident'. However, there is evidence suggesting that this factor does not distinguish between the 'Fortuitous' and 'Insecure' profiles on the one hand, and the 'Confident' profile on the other. The 'school SES' and 'proportion of minority students in the school' are largely unimportant. Their impact might be mediated through the achievement of the school on average, but it might also be related to the phenomenon of the 'frog-pond effect' mentioned earlier. 5.11 Having examined how the different social, economic and school factors affect the location within the typology and demonstrated how each profile is empirically distinguished, I will discuss some of the key findings and the conclusions drawn in the following section. 6.1 The main purpose of this paper was to introduce a new typology of educational aspirations, expectations and academic achievement as an enhanced and innovative approach to consider the ways in which these constructs relate to each other and to examine the conditions in which they are aligned. It was argued that the destination profile (location within this typology) is not only determined by the different social and economic opportunity structures available to students according to gender, ethnicity and class, but also by the specific set of values and norms (subculture) held by the students and their parents, as suggested by a number of previous studies (Gibbons 2002; Watts and Bridges 2006; Gutman and Ackerman 2008, Sugarman 1970).In the last few decades, and particularly since the 1960s and 1970s, a great deal of effort and attention has been devoted to the study of educational aspirations, expectations and achievement. The main reason is the assumption, very often supported by empirical evidence, that aspirations and expectations play an important role in determining students' future achievement(Alexander et al. 1975, Marjoribanks 1998).This study has shown that the relationship between aspirations, expectations and scholastic achievement is in fact far from simple, direct or obvious. In many cases, the study has suggested that high aspirations or high expectations are not associated with high achievement, which is in line with recent studies in the UK (St. Clair et al. 2013, Gorard et al. 2012, Carter-Wall and Whitfield 2012). Likewise, it has revealed that low aspirations or low expectations do not necessarily have a negative impact on future achievement, which challenges the conclusion of Portes et al. (2010) that the relative low aspirations and low expectations of second generation immigrants in Madrid would have a negative impact on their future achievement. These findings reinforce the incongruent nature of the relationship between aspirations, expectations and achievement (Hanson 1994, Schneider and Stevenson 1999, Hill and Torres 2010), and I can conclude that aspirations and expectations are not accurate predictors of achievement, which is contrary to what sociologists asserted some forty years ago (Sugarman 1970, Willis 1977). 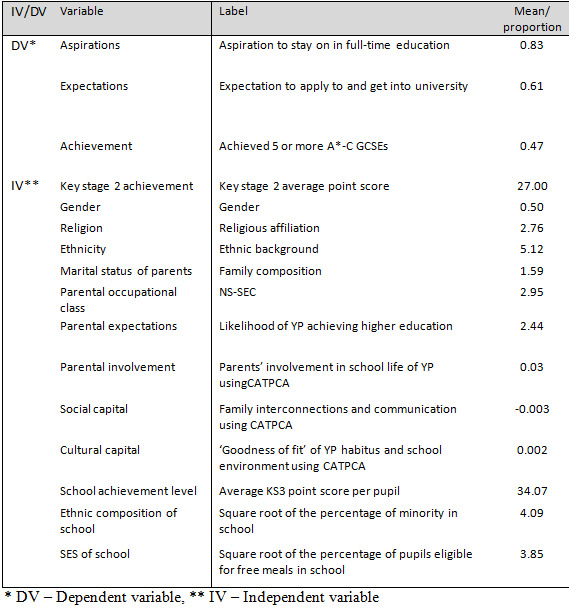 6.2 One of the most noticeable examples in this study, illustrating the detached relationship between aspirations, expectations and achievement, is that of Pakistani and Bangladeshi students. These students have high academic achievement without necessarily having developed high aspirations, expectations, or both. They are the only group to have higher probabilities of falling within profiles such as 'the Contestant', 'the Insecure' and 'the Fortuitous' than the majority White group. They might be reaching high achievement through hard work, strong family social capital or high parental encouragement — ethnic capital (Shah et al. 2010) — but at the same time experiencing the hardships of growing up in low social class areas and/orin immigrant families. Indeed, ethnic capital, which is external to the individual (Borjas 1999, Modood 2004), is important in compensating for the socio-economic deficit at the individual level, as has been confirmed in a recent study that examined the educational achievement of second generation immigrants in Belgium (Fleischmann et al. 2013). Their findings suggested that once family resources have been taken into account, community resources (ethnic capital) have significant effects on the attainment of second generation immigrants. In the British context, Modood (2004) and Shah et al. (2010) have pointed out that the ethnic capital within the Pakistani community has played a key role in their educational success. 6.3 The findings in relation to the Pakistani and Bangladeshi groups can be understood in light of this ethnic capital, which facilitates their educational progress in spite of their initial social and economic disadvantage at the family level. Their low expectations (within the 'Contestant' profile) are likely to be associated with their understanding and awareness of the structural barriers they might encounter within society. Their educational success is likely to be an outcome of the presence of co-ethnic resources. However, in this study I did not have a direct measure of ethnic capital, and so in order to develop this typology further and provide a better understanding of why some students are found in profiles such as the 'Contestant', future studies should include a measure of ethnic capital. 6.4 While this might explain the behaviour of some ethnic groups, it certainly does not explain that of Black Africans. This ethnic group seems to be, more than the majority White population, ending up in the 'Confident' profile, where educational aspirations, expectations and achievement are all high. This finding is not at all surprising given their general educational profile in Britain (Khattab 2009). It is possible that Black Africans understand that the primary way in which to overcome the deleterious effect of colour racism in Britain is through educational success. Additionally, the proportion of Black African parents (first generation) with higher education is higher relative to many other groups; however, it is generally not reflected in their SES due to discrimination in the labour market and the refusal of many employers to treat their overseas qualifications in the same way as those obtained in Britain. This finding might also be related to their overconcentration in London, which is ethnically quite different from other cities in Britain. Future research would enhance our understanding of Black Africans in education by taking into account their spatial concentration and residential patterns. 6.5 This study suggests that family-based factors such as family type, social capital, social class, parental expectations and involvement, as well as previous academic achievement of students, are far more important than school-based factors in determining the specific profile in which a student belongs. More importantly, this study has clearly demonstrated that the reciprocal relationship between educational aspirations, expectations and achievement in each profile is a product of different social and economic positions. It is only under certain conditions that the three converge, but for most people these three components do not always correspond. While the ultimate objective of most students is high academic achievement, it seems that many succeed without having developed high aspirations or high expectations. This might be a strategic and conscious decision in order to prevent future disappointment and frustration when and if aspirations are not fulfilled. Moreover, for one out of every five students, even high aspirations and expectations do not help to reach high academic achievement (those in the 'Deceived' profile). 6.6 Amongst the above family-based factors, parental expectations were found to be the most important in assigning students to different profiles within the typology. Parental expectations reflect very deep culturally-based attitudes that are, as a 'self-fulfilling prophecy', transferred onto their children, thereby affecting their level of academic achievement(Ogbu and Matute-Bianchi 1986).This study found that extremely high parental expectations (as defined here) help create consistent attitudes and behaviours, or 'aligned ambitions'. It should be noted, however, that high parental expectations can only be this influential if they are being conveyed to the children through forms of strong family social capital, as suggested by (Marjoribanks 2002). It is likely that high parental expectations help align children's ambitions through a number of mechanisms such as empowerment or development of self-efficacy, well defined targets and life goals. This research did not examine these mechanisms due to data limitations. Accordingly, future research would expand our understanding of the role of parental expectations in developing aligned ambitions by looking specifically at these mechanisms. 6.7 There seems to be important policy implications from this study in addition to its theoretical, empirical and methodological contributions. As St. Clair et al. (2013) and Gorard et al. (2012) have argued, a national policy aiming to raise the aspirations of students, especially those from disadvantaged backgrounds, is not the answer for underperforming students. Aspirations might be an important factor amongst students with high school performance, pushing them in the right direction (e.g. To pursue higher education), but do not seem to be the only force behind their high achievement. 6.8 In order to improve the school achievement of students from marginalised communities, more resources are needed at school and community level. At school level, greater resources (e.g. more support staff, teaching assistants and other specialists) would allow schools to provide more tailored 'learning suites' per student or small groups of students. There should be a shift from an approach assuming that different students have different capabilities to an approach assuming similar capabilities but different pace requirements. 6.9 Community-level intervention, particularly targeting parents, could be extremely helpful. In light of this study's findings, it may be beneficial to raise parents' expectations for their children, and, importantly, to equip them with the skills and knowledge they need to help their children convert their high aspirations into actual attainment. In some cases, extra learning support and extra lessons will be needed. Many economically affluent families already access such support. Those without access to such extra resources will not be able to help their children, and the student's achievement is then down entirely to the resources and quality of learning at school level. 6.10 To summarise, this study has suggested that under certain conditions, such as growing up in the middle or dominant classes, or within a family and a community rich in bridging and bonding social capitals, high aspirations and expectations are certainly connected to high achievement; yet their association does not reveal any causal relationship. As this study has shown, confirming the results of many previous studies (i.e. Schneider and Stevenson 1999, Modood 2004, Abbas 2007, Shah et al. 2010, Gibbons 2002; Watts and Bridges 2006; Gutman and Ackerman 2008), the family and community social capitals, parental expectations, active involvement in a student's school life, and all of the material and cultural capitals associated with social class, not only facilitate academic success, but also increase the likelihood of a coherent structure of aspirations, expectations and achievement. 2 Data from three different waves for every individual were only measured once, as a measurement at time 0, always preceding the measurement of GCSE scores. The same applies to ethnic group and gender. 3 No information on head of household or parents was available for YP who lived in households with no parents at all (less than 1.3% of YP), and they were therefore not included in the analysis. 4 KS3 point scores are used as they are the most relevant to the study sample and time 0. 5 Before making the decision to use dichotomised (binary) measures, I considered other ways and methods, such as continuous measures or an index of scores using a more sophisticated analysis of factor analysis or regressions. Given the fact that the literature does not offer any such measures, binary variables seemed to me to be the most practical and meaningful ones, even though they are imperfect (as most measures in social sciences probably are). BOHON, S. A., JOHNSON, M. K. and GORMAN, B. K. (2006). 'College aspirations and expectations among Latino adolescents in the United States'. BOURDIEU, P. (1984) Distinction: A social critique of the judgement of taste, Harvard University Press. BOURDIEU, P. (1997). 'The Forms of Capital', in HALSEY A H, LAUDER H, BROWN P and WELLS A S (eds. ), Education. Oxford University Press, Oxford. CAPLAN, N. S., CHOY, M. H. and WHITMORE, J. K. (1991) Children of the boat people: A study of educational success, University of Michigan Press. CARTER-WALL, C. and WHITFIELD, G. (2012). 'The role of aspirations, attitudes and behaviour in closing the educational attainment gap', York: Joseph Rowntree Foundation. CUMMINGS, C., LAING, K., LAW, J., MCLAUGHLIN, J., PAPPS, I., TODD, L. and WOOLNER, P. (2012). 'Can changing aspirations and attitudes impact on educational attainment', York: Joseph Rowntree Foundation. FLEISCHMANN, F., DEBOOSERE, P., NEELS, K. and PHALET, K. (2013). 'From Ethnic Capital to Ethnic Educational Inequality: How Family and Co-Ethnic Neighbourhood Resources Affect Second-Generation Attainment in Belgium', European Sociological Review, p. jct010. GIBBONS, S. (2002) Neighbourhood effects on educational achievement, Centre for the Economics of Education, London School of Economics and Political Science. GOLDTHORPE, J. H. (2007) On sociology, Stanford University Press. GORARD, S., SEE, B. H. and DAVIES, P. (2012). The impact of attitudes and aspirations on educational attainment and participation. GREEN, A. E. and WHITE, R. (2007). 'Attachment to place: social networks, mobility and prospects of young people'. GUTMAN, L. and AKERMAN, R. (2008) Determinants of aspirations, Centre for Research on the Wider Benefits of Learning, Institute of Education, University of London. OGBU, J. U. and MATUTE-BIANCHI, M. E. (1986). 'Understanding sociocultural factors: Knowledge, identity, and school adjustment', Beyond language: Social and cultural factors in schooling language minority students, p. 73-142. SCHNEIDER, B. and STEVENSON, D. (1999) The Ambitious Generation: America's Teenagers, Motivated but Directionless, Yale University Press, New Haven and London. SEWELL, W. H. and HAUSER, R. M. (1975). 'Education, Occupation, and Earnings. Achievement in the Early Career'. SUGARMAN, B. (1970). 'Social Class, Values and Behaviour in Schools', in CRAFT M (ed. ), Family, Class and Education. Longman, London. WILLIS, P. (1977) Learning of Labour, Saxon House., Hants. ZHOU, M. (2005). 'Ethnicity and social capital: community-based institutions and embedded networks of social relations', in LOURY G C, MODOOD T and TELES S M (eds. ), Ethnicity, Social Mobility and Public Policy. Cambridge University Press, Cambridge, p. 131-159. ZHOU, M. and BANKSTON, C. (1998) Growing up American: How Vietnamese children adapt to life in the United States, Russell Sage Foundation.